New York: Kodansha. 1997. First Edition; Second Printing. Hardcover. 1568361548 . Fine in a Fine dust jacket. ; 9.29 X 6.60 X 1.25 inches; 371 pages; Original unclipped dust jacket protected by archival Brodart cover. All domestic orders shipped protected in a Box. .
Toronto: McClelland & Stewart, Inc.. 1992. First Edition; First Printing. Hardcover. 0771012128 . Very Good in a Very Good dust jacket. ; 9.50 X 6.60 X 1.90 inches; 480 pages; Original unclipped dust jacket protected by archival Brodart cover. All domestic orders shipped protected in a Box. .
Toronto: McClelland & Stewart Inc. BOOK: Corners, Spine, Boards Bumped; Light Shelf Rub to Boards; Edges Lightly Soiled; Moderate Fading Due to Sun Exposure. DUST JACKET: Missing.. Hard Cover. Good/No Jacket. 8vo - over 7¾" - 9¾" tall. Toronto, Ont: McClelland & Stewart. Very Good+ in Very Good+ dust jacket. 1992. Hardcover. 0771012128 . Red hard boards with gilt lettering on spine, there is slight bumping on the spine end and bottom corner. A blind stamp from the previous owner is on the half title page. Clean & bright with a solid binding. Double end papers at the front, end papers depict sketches of the main characters of this book. The DJ is unclipped and has minor edgewear but still glossy and very nice. Includes nine maps, fifty illustrations and many black & white photos. "Popular historian Pierre Berton traces the history and allure of one of America's great natural phenomena. 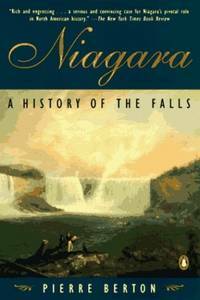 As Thurston Clarke noted in his front page "New York Times Book Review," Berton "makes a serious and convincing case for Niagara's pivotal role in North American history.... "; 1.75 x 10 x 6.75 Inches; 480 pages . McClelland & Stewart Ltd, 1992. pp.480 with index.b /w photos & illustrations. clean tight copy with slight bumping to corners and slight edgewear. First. Hard Cover. Near Fine/Near Fine. 8vo - over 7¾" - 9¾" tall. Niagara A History of the Falls. NY, NY: Kodansha International, 1992. Very good hard cover with light cover wear in a very good dust jacket with light wear. Not a library discard. No underlining, highlighting or other markings.. Hard Cover. Very Good/Very Good. Penguin Books. Very Good+. 1998. Paperback. 0140270167 . Very good paperback with tight binding and clean pages. Very minimal shelf wear to edges and corners of covers and spine. ; 7.70 X 5 X 1.30 inches; 371 pages .